I received this product for free from the sponsor of the Moms Meet program, May Media Group, LLC, who received it directly from the manufacturer. As a Moms Meet blogger, I agreed to use this product and post my opinion on my blog. My opinions do not necessarily reflect the opinions of May Media Group, LLC or the manufacturer of the product. With all the news out lately about how bad certain food additives are for you, it makes me want to stop shopping at the store, plant a full garden, buy a cow and some chickens, and start making everything from scratch. Unfortunately, that isn’t going to happen. First of all, I am terrible at gardening (heck, I couldn’t even keep my Christmas Cactus alive), and the homeowners’ association around here doesn’t allow livestock, plus my neighbors might want to kill me. And, well, let’s face it…all that work is just too much! So that leaves one option: searching out healthy, all-natural products to serve to my family. Thank goodness there are companies out in the world who cares as much about families eating healthy as I do. One of them is YoYummy and Green Mountain Creamery. Not only is YoYummy actually yummy, but it is made with the environment in mind. The milk that goes into the yogurt is locally produced, and the company uses BPA-free materials. And did I mention that YoYummy really does taste good? Tell me what you make of this: YoYummy sent me 2, 12-packs and 1 4-pack of their delicious yogurt on a Tuesday, and all but 2 packs were gone by Saturday, eaten exclusively by my 2 tiny children. I’m so glad that my kids didn’t spend a whole week swallowing down high-fructose corn syrup, chemicals with names that I can’t pronounce, and other artificial junk. I’m happy that they were consuming a calcium-rich snack with real berries and fruits. If you are interested in learning more for yourself about YoYummy yogurt, head over to their web site to read about their latest flavors, download some fun coloring sheets, and print some coupons to help you save on your first purchase of YoYummy. 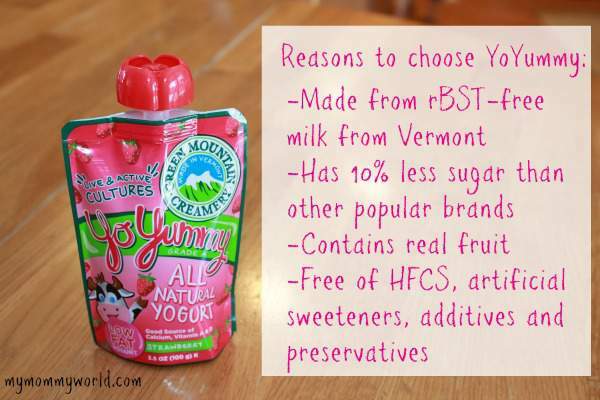 You can also follow along with YoYummy on Facebook, Twitter and Pinterest. 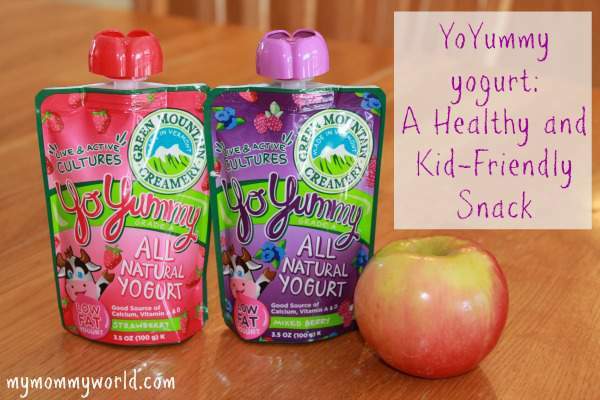 What do you appreciate most about healthy, kid-friendly snacks like YoYummy? My son recently discovered applesauce in a squeeze pack and he really liked them. I see your kids loved these too. It’s great that it’s something the kids will eat and it’s good for them too.